Trov lets users easily navigate and purchase insurance for their devices via a mobile app. Mobile app-based insurance platform Trov aims to revolutionise the global insurance industry by enabling users to instantly insure specific devices for particular periods of time. The US-developed platform, which works with insurance providers to facilitate its services, has just debuted in Australia, and will reach UK users later in 2016, and then the US and other regions "in 2017 and beyond", the company vows. 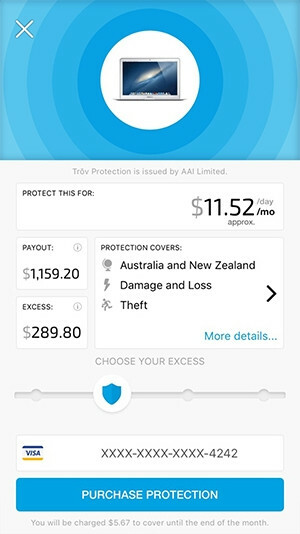 Through Trov's iOS app, users specify the specific device or item they would like to insure and set a limit for how much excess they are willing to pay upon making a claim, before swiping right to opt into the insurance policy Trov presents them with. Should an insured item be stolen, lost, or accidentally damaged, the app can also be used to make a claim through Trov's interactive chat bot, which can ask users questions to facilitate this, such as "when and where did it happen?" and "do you have photographs [to back up the claim]?" Users can also flip a toggle switch to "turn protection on or off at any time", according to Trov's Web site. Founder and CEO Scott Walchek told Mashable that the app aims to lead a move toward "micro-duration policies". While Trov's offering may sound too good to be true to potential users, Walchek added that it offers insurers a valuable "bridge to a [younger] generation they can't serve through arcane practices and legacy technology". At present, Trov only offers Australian users protection on portable consumer electronics such as smartphones, tablets and laptops, although it aims to extend its portfolio to other items, such as home appliances and entertainment systems, sports equipment, and musical instruments.